This article is all about how to interface push button switches to an 8051 microcontroller. Push button switches are widely used in embedded system projects and the knowledge about interfacing them to 8051 is very essential in designing such projects. A typical push button switch has two active terminals that are normally open and these two terminals get internally shorted when the push button is depressed. Images of a typical pushbutton switch is shown below. The circuit diagram for interfacing push button switch to 8051 is shown above. AT89S51 is the microcontroller used here. The circuit is so designed that when push button S1 is depressed the LED D1 goes ON and remains ON until push button switch S2 is depressed and this cycle can be repeated. Resistor R3, capacitor C3 and push button S3 forms the reset circuitry for the microcontroller. Capacitor C1, C2 and crystal X1 belongs to the clock circuitry. R1 and R2 are pull up resistors for the push buttons. R4 is the current limiting resistor for LED. MOV P0,#83H // Initializing push button switches and initializing LED in OFF state. READSW: MOV A,P0 // Moving the port value to Accumulator. SJMP READSW // Read switch status again. SJMP READSW // Jumping to READSW to read status of switch 1 again. The first instruction – MOV P0 #83H - is to turn LED off (Hex 83 in binary = 10000011) and to initialize switches 1 and 2. Switch 1 is connected to port 0.0 and switch 2 is connected to port 0.1. Also note that LED is connected to port 0.7. The program has two labels – READSW and NXT. It’s all about reading switch values – that is P0.0 and P0.1. We are using RRC instruction to read switch values. The values of port 0 is moved to accumulator. Since port 0 and 1 are used to interface switches 1 and 2, we can get the values of both port bits in LSB”s 0 and 1 of accumulator by using MOV A,P0 instruction. RRC – means – rotate right through carry. You can learn more about this instruction here – 8051 programming tutorial 1 . What RRC do is simple – it will move value of port 0.0 to the carry bit. Now we can check the carry bit using instruction JC – which means “jump if carry is set” . If carry is SET – then it means port0.0 =1 and this means switch 1 is OFF. If switch 1 is OFF then we have to check status of switch 2 and that is why we jump to label NXT. In the mean time if switch 1 is pressed – then value of port 0.0 will be equal to zero. This will get moved to accumulator and hence an RRC will result in carry bit = o. If carry bit = 0 then result of executing JC instruction is negative and it will not jump. The next instruction will get executed – that is CLR P0.7. This clears port 0.7 to zero and hence LED will turn ON. Once turned On- LED will be kept On until switch 2 is pressed. Toggling 2 LED with a pushbutton using interrupt. This circuit demonstrates how to toggle two LEDs with a single push button using the external interrupts. Interrupt is an asynchronous signal (either hardware or software) which indicates the processor to make a change in current execution. When the processor receives a valid interrupt signal it saves the current state and then goes to execute a set of predefined steps called interrupt service routine (ISR). After executing ISR, the processor goes back to the point where it deviated and continues from there. To learn more about interrupts check this link. External interrupt handling in 8051. In the circuit shown above D1, D2 (the LEDs to be toggled) are connected to P1.0 and P1.1 respectively. R2 and R4 limits the current through the LEDs. The push button switch S2 is connected to the INT0 pin where R1 is a pull up resistor and C4 is the debouncing capacitor. C3, R3 and S3 forms the reset circuitry. Capacitors C2, C2 and crystal X1 are related to the clock circuitry. When powered ON LED D1 will be OFF and and LED D2 will be ON. Whenever push button switch S2 is pressed it creates an interrupt and the software makes the status of P1.o and P1.1 to toggle which gets reflected in the LEDs. 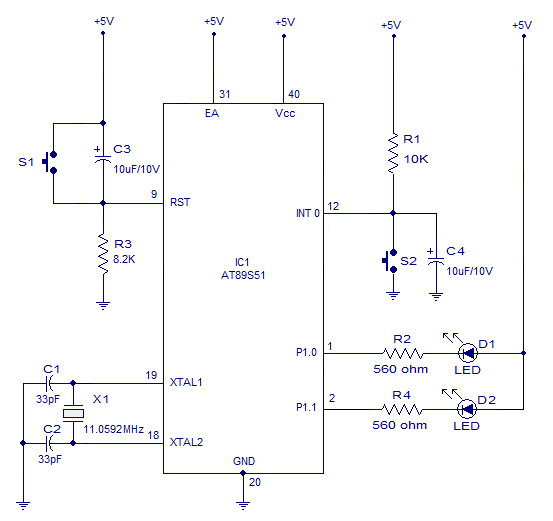 If you come across any doubts/errors while implementing this circuit, please feel free to ask in our comments section.